Expecting a completely smooth curve is obviously unrealistic. There are large differences in atmospheric composition between the planets which means that any exact fit is likely to be spurious (i.e. over-fitting). Better to use a model based on physics not (bad) statistics. The Poisson-like P-T relationship Ned has discovered is expressed as the Surface T with atmosphere divided by Surface T with no atmosphere, plotted against surface pressure. What “(bad) statistics” are you referring to? These are just plain physical parameters. overfitting and over-parameterisation, not acocunting for degrees of researcher freedom, not properly investigating out of sample prediction. All of these things a bad statistics. BS Gavin. There is no ‘fitting’ or ‘parameterisation’ involved in dividing surface T by no-atmos T and plotting that ratio against surface pressure. And the paper contains four out of sample predictions, one now validated, another awaiting data from the Mercury probe. Read it. It’s almost as if Roger was ignoring what I wrote and just making the same assertions again and again. The model can’t predict Venus as an out-of-sample prediction because the second component is there to bodge the model for that planet. 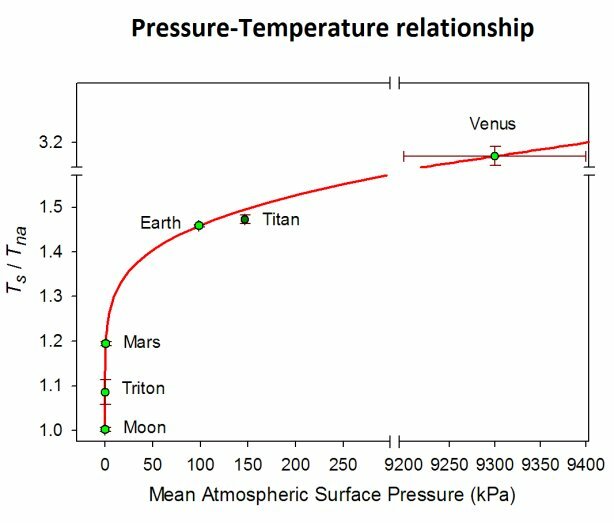 Venus’ surface pressure lies on a smooth continuum with other bodies’ surface pressures relative to the ratio of their actual and no-atmos surface temperatures, regardless of the no doubt imperfect numerical expression derived to describe it. No radiative factor has matched that. More argument by attrition. The N&Z model needs a separate component to get the temperature of Venus right, thus is can only predict the temperature of Venus if it is specifically baked into the model. That is overfitting, and smooth continuum most likely spurious. It’s not attrition Gavin, I’m just having to respond to your continued misrepresentations of what the data show. Not the numerical model Gavin, the data. The data have no ‘fitting’ to be ‘overfitted’. The data are what they are. “The data have no ‘fitting’ to be ‘overfitted’.” O.K. so you make it clear that you have no idea what “fitting” means, not surprising you don’t know what “over-fitting means”. Sorry, I have better things to do than explain the basics to someone who doesn’t want to know. You still seem to be fixated on statistics and numerical expressions that fit the data rather than doing what good empirical scientists do, which is to look at the P-T data, and compare it to other known ‘laws’ which define other P-T data. No, I have also explained the physics. As I said a thicker atmosphere will have a more effective greenhouse effect. I have also pointed out that pressure can only cause temporary heating via compression (Kelvin-Helmholtz mechanism). And you promised a continuum plot of your radiative greenhouse parameters solar system wide but failed to deliver. Change in P causes change in T. Constant P supports Constant T Please learn the gas laws to avoid elementary errors. Very wise. Ned already showed in his paper it doesn’t work. 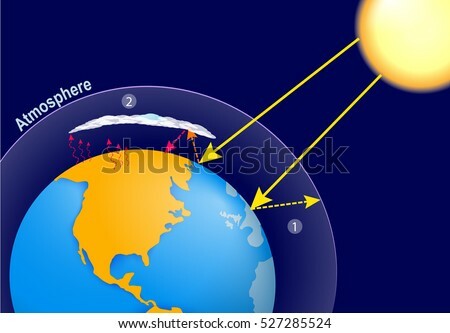 That’s because atmospheric mass, gravity and insolation define the energy/force envelope in planetary atmospheres that sets the surface temperature, not ‘greenhouse gases’. So when you wrote “And you promised a continuum plot of your radiative greenhouse parameters solar system wide but failed to deliver.” that was not a factually correct statement? Did you know that it was not a correct statement when you made it? It isn’t a factually incorrect statement. The temperatures of moons and planets can be explained by the greenhouse effect. How many times does that need to be pointed out to you? 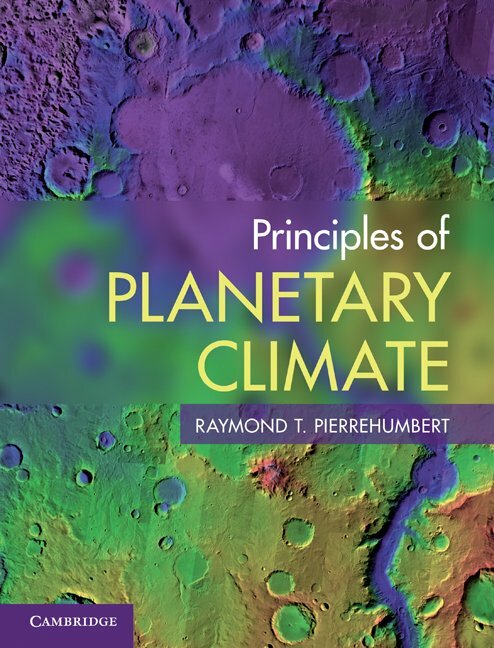 You have already been shown references to works on planetary climate based on std. climate physics. Repeatedly asking for things that you have already been given seems a common ploy for climate skeptics, but I’m not falling for it, just so you can ignore the answer yet again. Sure it can Gavin. But only by introducing lots more parameters than Ned uses, and ‘adjusting’ them planet by planet on an ad hoc basis to obtain a model fit. And even after $$$ billions spend. Climate models disagree about Earth’s surface T by 4C. well in that case it is “consistent with” duh! Thanks Gavin, I’ll leave it there. When doing science Gavin, I don't agree or disagree with vague verbal formulations. I patiently await the proponents presentation of supporting DATA. Good-faith scientific discussion involves presenting DATA to support your assertions Gavin. Not issuing Torquemada-style ultimatums against heretics while thumping your planetary atmospheres bible. Terminology problem: this ‘greenhouse’ doesn’t have any sides – so it’s not a greenhouse. oldbrew, you are not supposed to point out the flaws in the pronouncements of IPCC oracle and its minions, especially when said flaws don’t fit the perceived wisdom of fear, uncertainty and doubt. There is also a problem with that picture – the atmosphere doesn’t have a lid on it. My god. That was a real head banging conversation with a nonentity. Separating the real world from the modelled world seems to be the most difficult exercise a climate scientist can do. @Stephen R, I agree with you that it is almost impossible to separate a climate scientist from their models for the simple reason that if they do peek out from their model fantasy land the real world hits them and they haven’t a clue how to deal with that. I fear that a much greater effort will be needed to rehabilitate the members of the the church of climatology than any of the brainwashed members of another religious cult. Agree Stephen R and Ivan. Roger why talk to some nonentity that does not understand the basics and is blinded by socialist ideas. Referencing that fool Peirrehumbert is a clue to his political leanings rather than knowledge of factual information. The saying is one should not judge a book by its cover. In Pierrehumbert’s case he looks like a “green” hippy socialist fool which he clearly is. But the book cover is wrong – there are no principles inside, so supporting the saying. TB: good story there (Wiki, 6:37 AM) about why Ford’s American customers preferred the Japanese version of a gearbox in their cars to the US one, even though both were made to the same spec. Deming: “the performance of anyone is governed largely by the system that he works in”. We can’t have empirical data interfering with our fancy/fanciful climate theories, can we? Deming – a hero of mine……..